As a young farmer herself with her husband, Heather Thompson knows first-hand some of the challenges facing the new generation of agriculture. “My husband and I are just getting back to our own family farm operation,” says Thompson, who is Young Producer Programs Manager for GROWMARK. Some of the challenges new young farmers face include farming with multiple generations, financial concerns, and dealing with legislative and regulatory issues. 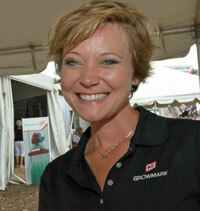 The program officially kicked off last month with the program development phase and GROWMARK hopes to have it in place by next summer.